Not all heroes wear capes, as Destiny Carreno recently discovered in a heartwarming encounter that has gone viral for all the right reasons. After stopping to grab a quick bite to eat on her way home from work, she witnessed an act of compassion so sweet that it brought tears to her eyes. 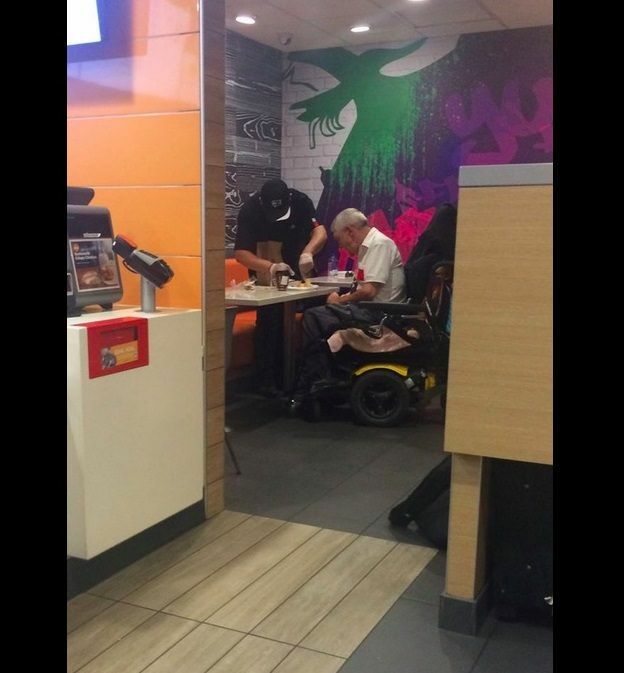 While waiting in line at McDonald’s, an elderly handicapped gentleman wheeled himself over to the cashier in front of her. She recognised his condition as some form of quadriplegia, as her uncle is also a sufferer. The man politely tried to ask the cashier a question, but it took a few tries before Destiny or the cashier could understand that he was saying “Help me please.” Neither of them knew what it was exactly he needed help with, but after a series of trial and error realised the gentleman needed help with his meal. Destiny intially thought the employee wasn’t going to help the man cut or eat his meal, as it was rush hour in downtown Chicago. But to her surprise the cashier shut down his register and went to wash and glove his hands, before assisting the man with his food. Destiny decided to stick around to see how the situation would unfold, as the situation hit close to home because of her uncle having a similar disability. She watched as the cashier cut and fed the man his meal, calling it the kindest and humblest thing she had ever seen. She later posted the story and an accompanying photo on Facebook, which now has over 400,000 shares! If you think you're a bit of a nerd, rest assured! Some of the hottest celebs are much geekier than you and these unusual hobbies prove it! Saddest Celeb Break Ups Of 2015 – I Cried Buckets for them!